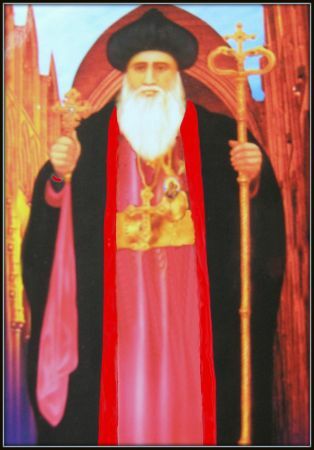 St. Yeldho Mar Baselios was born in a village called kooded (now known as Karakosh) near Mosul in Iraq where Morthsmooni and her 7 children suffered martyrdom. At a very young age he joined the Mar Bahnan Monastery and become a monk. In 1678 he was consecrated Catholicos by the Patriarch of Antioch Mar Ignatius Abdul Masih I. In 1685 at the age of 92, the Holy Father started the difficult mission to India at the request of Marthoma II of Malankara who informed the Patriarchate about the unpleasant situation of the Church here. The saintly Maphryono was accompanied by his brother, two monks and an Episcopo, but only three of them are believed to have reached Malankara. The saint expired on Saturday afternoon on 'Kanni 19' (Malayalam Calendar), 1685 and was entombed on the very next day in the sanctuary of Mar ThomaCheriapally, Kothamangalam. Though the Holy Father had lived in this land for only a few days, his name has spread far and wide leaving a lasting mark in the history of Malankara Church. In 1947, Mar Baselios Yeldho of blessed memory was declared a saint by the then Catholicos of the church, His Holiness Baselius Geevarghese II. Saint Gregorios of Parumala is popularly known as "ParumalaThirumeni". 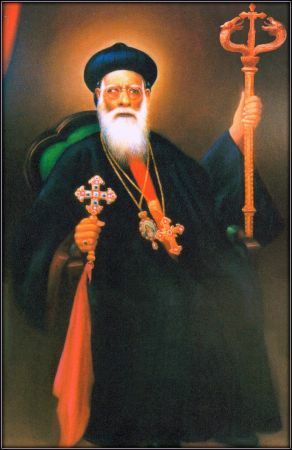 Metropolitan Geevarghese Mar Gregorios of the Malankara Orthodox Church who passed away on November 2nd 1902, became the first declared saint from Malankara (Kerala, India) naturally to be called, "ParumalaThirumeni". He shines in the cloud of witnesses as a bright luminary giving rays of hope to millions in their suffering and struggles. The Holy Father's life was extraordinary and blessed. He was born in a distinguished priestly family, he became a deacon at the age of 10, a priest at the age of 18 and a bishop at the young age of 28. He died at Parumala and was later canonized as saint. In his short span of earthly living, he has set an example of disciplined and devotional living with humility, fasting and prayer. He led an unassuming life with purity of conscience. His intercession has been effective to those who sought it, during his life, and even after his death, giving hope to many in their good and bad times. His Holiness tomb at Parumala is the refuge for thousands of people in distress by the ills of body and mind, and many who have visited the tomb bear witness to this. His grace and peace lives amongst the believers of Malankara Syrian Orthodox Church and many others. Thus he became the brightest jewel of spiritual brilliance and a divine guide to the many and he shines among the witnesses as a bright luminary. 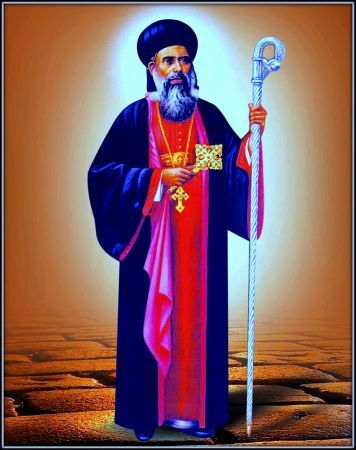 St. Geevarghese Mar Dionysius Vattasseril, Malankara Metropolitan, was a bright light for the Malankara Orthodox Syrian Church that illumined during her dark and tumultuous times and possessed the vision to bring the Church triumphantly from the bonds of foreign oppression. Thirumeni dedicated his entire life to secure the freedom and welfare of the Holy Church. He confronted the dangers and obstacles directly responding with vigor, strength and remarkable conviction and confidence in God's justice and plan, which was a product of his continual fasting and prayer. God protected Thirumeni throughout his life whether in Kerala or abroad as he sought the freedom of the Church. His great triumph lay in the ability to unite the entire Church, both the priests and laymen to follow his lead. He was incredibly gifted in many fields, a multifarious genius. He was a spiritual leader, a theological educator, scholar of languages, literature and traditions. He was a dignified, valorous and noble personality with a remarkable commanding power. Vattasseril Geevarghese Mar Dionysius is popularly known as Malankara Sabha Bhasuran (The Great Luminary of Malankara Orthodox Church) which our Church has bestowed on him in recognition of his rich contribution to Malankara Orthodox Church. Vattasseril Thirumeni was a man of prayer, determination and dynamism. He was a saint who never stooped before falsehood. He bravely fought for the establishment of Catholicate to be the symbol of self-identity and independence of the Malankara Orthodox Syrian Church. The unique and historic contribution of Mar Dionysius is the establishment of Catholicate in Malankara in 1912 at Kottayam. He can be called as the architect of the Indian Orthodox Church and thus endeared himself as one of the greatest fathers of the Indian Orthodox Church.